Genç M. S., Sekhoune K, Karasu İ, Özden M,, “AN AIRFOIL LOCATED FLAT PLATE ON PRESSURE SIDE”, TURKISH Patent, 2017/23311, 2017. 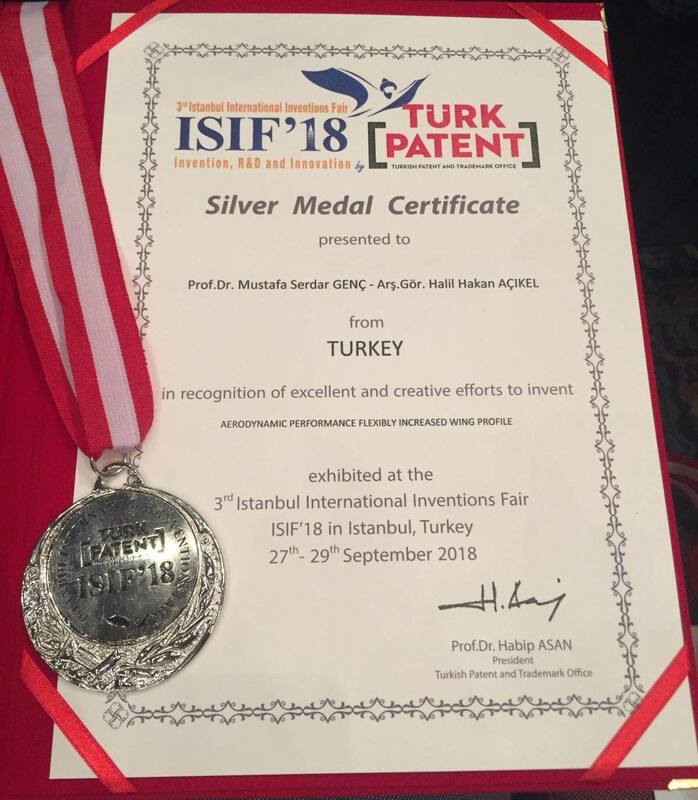 Genç M.S.,Özden M, Karasu İ, Sekhoune K,, “AN AIRFOIL WITH INTEGRATED VORTEX GENERATOR-FLAP SELF-ACTING BASED ON AIR VELOCITY”, TURKISH Patent, 2017/23597, 2017. M. Serdar GENÇ, Low Reynolds Number Aerodynamics and Transition, ISBN 978-953-51-0492-6, InTech-Open Access Publishing, 2012. M. Serdar GENÇ, İlyas Karasu, H. Hakan AÇIKEL, M. Tuğrul AKPOLAT, Gökhan ÖZKAN, Acoustic Control of Flow Over NACA 2415 Aerofoil at Low Reynolds Numbers. In: Karakoc T., Ozerdem M., Sogut M., Colpan C., Altuntas O., Açıkkalp E. (eds) Sustainable Aviation. Springer, Cham, 2016. M. Serdar GENÇ, İlyas Karasu, H. Hakan AÇIKEL, M. Tuğrul AKPOLAT, Low Reynolds number flows and transition, Low Reynolds Number Aerodynamics and Transition, Editor: M. Serdar GENÇ, InTech-Open Access Publishing, 2012. Ünver Kaynak, Samet Çaka Çakmakoğlu, M. Serdar GENÇ, Transition at Low-Re Numbers for Some Airfoils at High Subsonic Mach Numbers, Low Reynolds Number Aerodynamics and Transition, Editor: M. Serdar GENÇ, InTech-Open Access Publishing, 2012. M. Serdar GENÇ, Economic Analysis of Large-Scale Wind Energy Conversion Systems in Central Anatolian Turkey (Invited), Clean Energy Systems and Experiences, Editor: Kei Eguchi, pp. 131-154, ISBN 978-953-307-147-3, Intech-Sciyo, October 2010. Konstantinos P. Tsagarakis1 Loukia Efthymiou, Apostolos Michopoulos, Amaryllis Mavragani, Aleksandar S. Andelkovic, Francesco Antolini, Mario Bacic, Diana Bajare, Matteo Baralis, Witold Bogusz, Sébastien Burlon, João Figueira, M. Serdar Genç, Saqib Javed, Andrius Jurelionis, Kemal Koca, Grzegorz Ryzynski, Javier F. Urchueguia, Bojan Zlender, A Review of the Legal Framework in Shallow Geothermal Energy in Selected European Countries: Need for Guidelines, Renewable Energy, accepted, 2019. İlyas Karasu, H. Hakan AÇIKEL, Kemal Koca, M. Serdar GENÇ, Effects of Thickness and Camber Ratio on Flow Characteristics over Airfoils, Journal of Thermal Engineering, in press, 2018. M. Serdar GENÇ, Kemal KOCA, H. Hakan AÇIKEL, Investigation of Pre-Stall Flow Control on Wind Turbine Blade Airfoil Using Roughness Element, ENERGY, vol. 176, pp. 320-334, 2019. M. Serdar GENÇ, Gökhan Özkan, Mustafa Özden, Mehmet Sadık Kırış, Rahime Yıldız, Interaction of tip vortex and laminar separation bubble over wings with different aspect ratios under low Reynolds numbers, Proc IMechE, Part C- Journal of Mechanical Engineering Science, vol. 232 (22) pp. 4019-4037, 2018. H. Hakan AÇIKEL, M. Serdar GENÇ, Control of Laminar Separation Bubble over Wind Turbine Airfoil Using Partial Flexibility on Suction Surface, ENERGY, vol.165, pp.176-190, 2018. İlyas Karasu, Mustafa Özden, M. Serdar Genç, “Performance Assessment of Transition Models for 3D flow over NACA4412 wings at low Reynolds numbers”, Journal of Fluids Engineering-Transactions of The ASME, vol.140 (12), pp.121102-1-121102-15, 2018. Kemal Koca, M. Serdar GENÇ, H. Hakan AÇIKEL, Mücahit Çağdaş, Tuna Murat Bodur, Identification of Flow Phenomena over NACA 4412 Wind Turbine Airfoil at Low Reynolds Numbers and Role of Laminar Separation Bubble on Flow Evolution, ENERGY, vol 144, pp.750-764, 2018. Hacımurat Demir, M. Serdar GENÇ, An experimental investigation of laminar separation bubble formation on flexible membrane wing, European Journal of Mechanics B/Fluids, vol 65, pp. 326-338, 2017. Ferhat Daldaban, Ferhat Karagöz, M. Serdar GENÇ, A drag force anemometer using finite length cylinder with direction measurement capability, Measurement, vol.104, pp.117-122, 2017. Kemal Koca, M. Serdar GENÇ, H. Hakan AÇIKEL, Experimental Investigation of Surface Roughness Effect over Wind Turbine Airfoil, Çukurova Üniversitesi Mühendislik-Mimarlık Fakültesi Dergisi, cilt.31, ss.127-133, 2016. M. Serdar GENÇ, H. Hakan AÇIKEL, M. Tuğrul AKPOLAT, Gökhan ÖZKAN, İlyas KARASU, Acoustic control of flow over NACA 2415 aerofoil at low Reynolds numbers, Journal of Aerospace Engineering-ASCE, 29 (6), 04016045, 2016. H. Hakan AÇIKEL, M. Serdar GENÇ, Flow control with perpendicular acoustic forcing on NACA 2415 aerofoil at low Reynolds numbers, Proc IMechE, Part G- Journal of Aerospace Engineering, vol.230, pp.2447-2462, 2016. İlyas KARASU, M. Serdar GENÇ, H. Hakan AÇIKEL, Numerical Study on Low Reynolds Number Flows over an aerofoil, Journal of Applied Mechanical Engineering, 2:131, 2013. M. Serdar GENÇ, Unsteady Aerodynamics and Flow-Induced Vibrations of Low Aspect Ratio Rectangular Membrane Wing with Excess Length, Experimental Thermal and Fluid Science, vol 44, pp 749-759, 2013. M. Serdar GENÇ, Muhammet ÇELİK, İlyas KARASU, A Review on Wind Energy and Wind-Hydrogen Production in Turkey: A Case Study of Hydrogen Production via Electrolysis System Supplied by Wind Energy Conversion System in Central Anatolian Turkey, Renewable & Sustainable Energy Reviews, vol. 16, pp.6631–6646, 2012. Gülşah ÖZIŞIK, M. Serdar GENÇ, Hüseyin YAPICI, Transient Thermal Stress Distribution in a Circular Pipe Heated Externally with a Periodically Moving Heat Source, International Journal of Pressure Vessels and Piping, vol 99-100, pp. 9-22, 2012. Gamze GENÇ, Muhammet ÇELİK, M. Serdar GENÇ, Cost Analysis of Wind-Electrolyzer-Fuel Cell System for Energy Demand in Pınarbaşı-Kayseri, International Journal of Hydrogen Energy, Vol. 37 (17), pp. 12158-12166, 2012. M. Serdar GENÇ, İlyas KARASU, H. Hakan AÇIKEL, An experimental study on aerodynamics of NACA2415 aerofoil at low Re numbers, Experimental Thermal and Fluid Science, vol 39, pp. 252-264, 2012. P. Rojratsirikul, M. Serdar GENÇ, Z. Wang and I. Gursul, Flow-Induced Vibrations of Low Aspect Ratio Rectangular Membrane Wings, Journal of Fluids and Structures, vol. 27, pp. 1296–1309, November, 2011. M. Serdar GENÇ, Economic Viability of Water Pumping Systems Supplied by Wind Energy Conversion and Diesel Generator System in North Central Anatolian, Turkey, Journal of Energy Engineering-ASCE, Vol 137 (1), 21-35, 2011. M. Serdar GENÇ, Ünver KAYNAK, Hüseyin YAPICI, Performance of Transition Model for Predicting Low Re Aerofoil Flows without/with Single and Simultaneous Blowing and Suction, European Journal of Mechanics B/Fluids, vol 30 (2), pp. 218-235, 2011. M. Serdar GENÇ, Numerical Simulation of Flow over an Thin Aerofoil at High Reynolds Number using a Transition Model, Proc IMechE, Part C- Journal of Mechanical Engineering Science, Vol 224 (10), pp. 2155 – 2164, 2010. Hüseyin Yapıcı, Gülşah Özışık, M. Serdar GENÇ, Non-Uniform Temperature Gradients and Thermal Stresses Produced by a Moving Heat Flux Applied on a Hollow Sphere, SADHANA-Academy Proceedings In Engineering Science, Vol. 35, Part 2, pp. 195-213, 2010. Murat Gökçek, M. Serdar GENÇ, Evaluation of electricity generation and energy cost of wind energy conversion systems (WECSs) in Central Turkey, Applied Energy, vol. 86, pp. 2731–2739, 2009. M. Serdar GENÇ, Murat Gökçek, Evaluation of Wind Characteristics and Energy Potential in Kayseri, Turkey, Journal of Energy Engineering-ASCE, Vol. 135 (2), pp. 33-43, 2009. M. Serdar GENÇ, Ünver Kaynak, Gary D. Lock, Flow over an Aerofoil without and with Leading Edge Slat at a Transitional Reynolds Number, Proc IMechE, Part G- Journal of Aerospace Engineering, vol. 223(G3) 217-231, 2009. M. Serdar GENÇ, Gülşah Özışık, Hüseyin Yapıcı, Numerical Study on Thermally Induced Stress Distributions in a Rotating Hollow Disk Heated from One Side Surface with a Moving Heat Source, Proc IMechE, Part C- Journal of Mechanical Engineering Science, vol. 223(8), pp.1877-1887, 2009. Gülşah Özışık, M. Serdar GENÇ, Temperature and Thermal Stress Distribution in a Plate Heated From One Side Surface with a Moving Heat Source, Journal of The Faculty of Engineering and Architecture of Gazi University, Vol 23, No 3, 601-610, 2008. M. Serdar GENÇ, Gülşah Özışık, Nafiz Kahraman, Investigation of Aerodynamics Performance of NACA0012 Aerofoil with Plain Flap, Isı Bilimi ve Tekniği Dergisi-Journal of Thermal Science and Technology, Vol. 28 (1), 1-8, 2008. Hüseyin Yapıcı, M. Serdar GENÇ, Gülşah Özışık, Transient Temperature and Thermal Stress Distributions in a Hollow Disk Subjected to a Moving Uniform Heat Source, Journal of Thermal Stresses, Vol. 31 (5), pp. 476–493, 2008. Z. Gül Apalak, M. Kemal Apalak, M. Serdar GENÇ, Progressive Damage Modeling of an Adhesively Bonded Composite Single Lap Joint Under Flexural Loads at the Mesoscale Level, Journal of Reinforced Plastics and Composites, Vol. 26, No. 9, pp. 903-953, 2007. Z. Gül Apalak, M. Kemal Apalak, M. Serdar GENÇ, Progressive Damage Modeling of an Adhesively Bonded Unidirectional Composite Single-lap Joint in Tension at the Mesoscale Level, Journal of Thermoplastic Composite Materials, Vol. 19, No. 6, pp. 671-702, 2006. M. Serdar GENÇ, Onur KOŞAR, Gökhan ÖZKAN, İlyas KARASU, Aerodynamic Optimization of Small Wind Turbine For Kayseri-Pinarbaşi Wind Potential, International Symposium on Sustainable Aviation, May 31- June 3, 2015, Istanbul, TURKEY. M. Serdar GENÇ, H. Hakan AÇIKEL, M. Tuğrul AKPOLAT, Gökhan ÖZKAN, Acoustic Control of Separated Flow over Naca2415 Aerofoil at Low Re Numbers, International Symposium on Sustainable Aviation, May 31- June 3, 2015, Istanbul, TURKEY. Halil Hakan AÇIKEL, M. Serdar GENÇ, Gökhan ÖZKAN, Onur KOŞAR, İlyas KARASU, An Investigation Of Flow Over NACA 2415 Aerofoil Using PIV, 8th ANKARA INTERNATIONAL AEROSPACE CONFERENCE, AIAC 2015, 10-12 September 2015 – METU, Ankara TURKEY. Onur KOŞAR, M. Serdar GENÇ, İlyas KARASU, Gökhan ÖZKAN, Aerodynamics Design of a Micro Scaled Wind Turbine Based on Wind Potential of Kayseri-Pınarbaşı, International Conference and Exhibition on Mechanical and Aerospace Engineering, September 30-October 2 2013, San Antonio, Texas, USA. İlyas KARASU, M. Serdar GENÇ, H. Hakan AÇIKEL, Numerical and Experimental Study on Low Reynolds Number Flows over NACA2415 aerofoil, International Conference and Exhibition on Mechanical and Aerospace Engineering, September 30-October 2 2013, San Antonio, Texas, USA. M. Tuğrul AKPOLAT, K. Atılgan TOKER, M. Serdar GENÇ, Design and Optimization of a Notional Scramjet by Means of Stream Thrust Analysis and Design of Experiments, 19th AIAA International Space Planes and Hypersonic Systems and Technologies Conference, Georgia, Atlanta, USA, 2014. 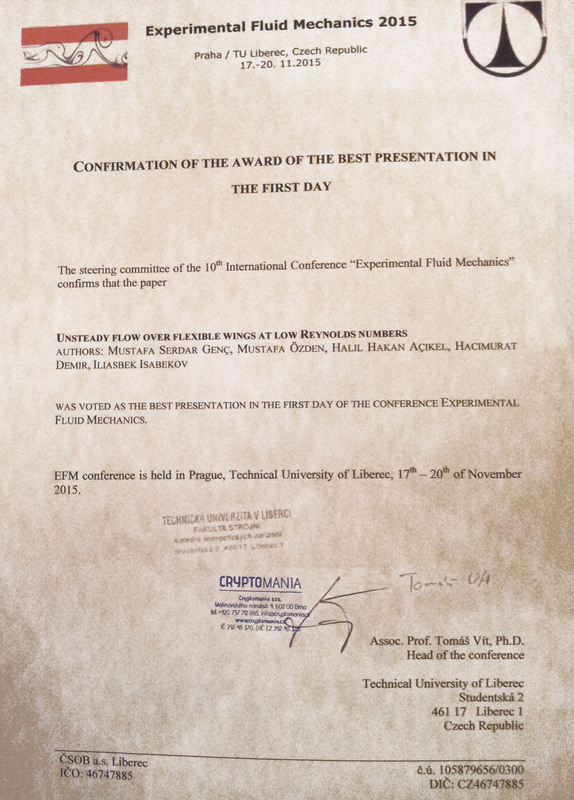 M. Serdar GENÇ, M. Tuğrul AKPOLAT, H. Hakan AÇIKEL, İlyas KARASU, An Experimental Study of Perpendicular Acoustic Disturbances Effect on Flow Over an Aerofoil at Low Reynolds Numbers, ASME 2012 International Mechanical Engineering Congress & Exposition IMECE2012 November 9-15, 2012, Houston, Texas, USA. Muhammet ÇELİK, Gamze GENÇ, M. Serdar GENÇ, Hüseyin YAPICI, Hydrogen Production Potential And Cost Of Wind-Hydrogen Hybrid Energy System, ASME 2012 International Mechanical Engineering Congress & Exposition IMECE2012 November 9-15, 2012, Houston, Texas, USA. 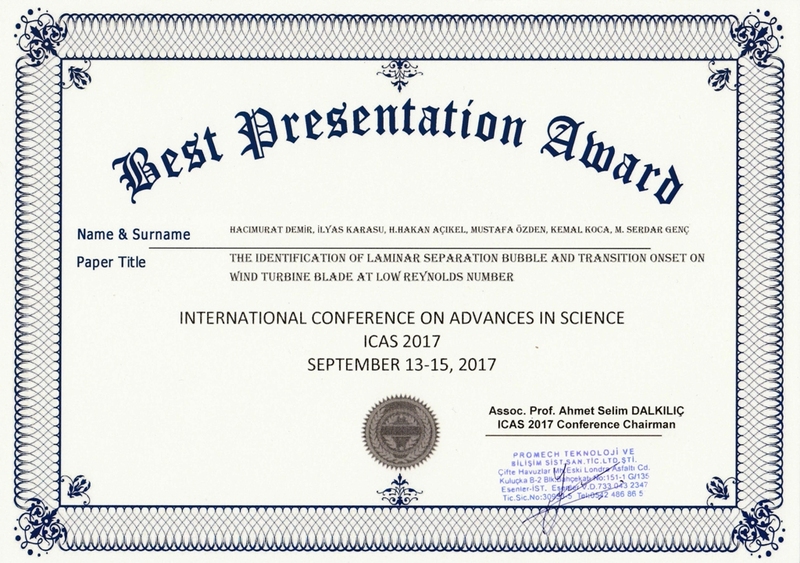 H. Hakan AÇIKEL, M. Serdar GENÇ, M. Tuğrul AKPOLAT, İlyas KARASU, An experimental study of acoustic disturbances effect on laminar separation bubble and transition on an aerofoil at low Reynolds number, AIAA-2012-2684, 6th AIAA Flow Control Conference, New Orleans, Louisiana, USA, 25-28 June 2012. İlyas KARASU, M. Serdar GENÇ, H. Hakan AÇIKEL, M. Tuğrul AKPOLAT, An experimental study on laminar separation bubble and transition on an aerofoil at low Reynolds number, AIAA-2012-3030, 30th AIAA Applied Aerodynamics Conference, New Orleans, Louisiana, USA, 25-28 June 2012. Samet Çaka Çakmakçıoğlu, Ünver Kaynak, M. Serdar GENÇ, Transition at Low-Re Numbers for UAV Type Airfoils at High Subsonic Mach Numbers, AIAA-2012-3118, 30th AIAA Applied Aerodynamics Conference, New Orleans, Louisiana, USA, 25-28 June 2012. M. Serdar GENÇ, Ünver Kaynak, Control of Flow Separation and Transition Point over an Aerofoil at Low Re Number using Simultaneous Blowing and Suction, AIAA-2009-3672, 19th AIAA Computational Fluid Dynamics Conference, 22-25 Jun 2009, Grand Hyatt Hotel, San Antonio, Texas, USA. M. Serdar GENÇ, Ünver Kaynak, Control of Laminar Separation Bubble over an NACA2415 Aerofoil at Low Re Transitional Flow using Blowing/Suction, 13th International Conference on Aerospace Sciences & Aviation Technology, May 26-28, 2009, ASAT 2009-Military Technical College, Cairo, EGYPT. M. Serdar GENÇ, Gary D. Lock, Ünver KAYNAK, An Experimental and Computational Study of Low Re Number Transitional Flows over an Aerofoil with Leading Edge Slat, AIAA-2008-8877, 8th AIAA Aviation Technology, Integration and Operations Conference (ATIO 2008), Anchorage, Alaska, USA, 14-19 September 2008. M. Serdar GENÇ, Gülşah ÖZIŞIK, Investigation of Aerodynamics Performance of Moving Airfoil and Flap Using Dynamic Mesh,The 4th Ankara International Aerospace Conference AIAC’2007, METU, Ankara, Turkey, 10-12 September 2007. Z. Gül Apalak, M. Serdar GENÇ, M. Kemal Apalak, Failure analysis of an adhesively bonded carbon fiber reinforced polymeric (CFRP) composite single lap joint under flexure loads, 7. International Fracture Conference IFC 2005, Kocaeli, Turkey, 19-21 October 2005. Z. Gül Apalak, M. Serdar GENÇ, M. Kemal Apalak, Damage zone growth in an adhesively bonded composite single lap joint , The 11th International Conference on Machine Design and Production UMTIK 2004, METU, Antalya, Turkey, 13-15 October 2004. Halil Hakan AÇIKEL, M. Serdar GENÇ, Onur KOŞAR, Gökhan ÖZKAN, NACA 2415 Kanat Profili Üzerinde Oluşan Akışa Dik Ses Dalgalarının Etkisinin Deneysel Olarak İncelenmesi, ULIBTK’13 19. Ulusal Isı Bilimi ve Tekniği Kongresi, 09-12 Eylül 2013, SAMSUN. H. Hakan AÇIKEL, M. Serdar GENÇ, M. Tuğrul AKPOLAT, İlyas KARASU, Düşük Re Sayılı Akışta NACA 2415 Kanat Profili Üzerinde Oluşan Laminer Ayrılma Kabarcığına Akışa Paralel Ses Dalgalarının Etkisi, IV. Ulusal Havacılık ve Uzay Konferansı, 12-14 Eylül 2012, Hava Harp Okulu, İstanbul. İlyas KARASU, M. Serdar GENÇ, H. Hakan AÇIKEL, M. Tuğrul AKPOLAT, Düşük Re Sayılı Akışlarda NACA 2415 Kanat Profili Üzerinde Oluşan Laminer Ayrılma Kabarcığının Deneysel İncelenmesi, IV. Ulusal Havacılık ve Uzay Konferansı, 12-14 Eylül 2012, Hava Harp Okulu, İstanbul. M. Serdar GENÇ, S.Samed Seyitoğlu, Kayseri Güneş Enerjisi Potansiyeli ve Maliyet Analizi, ULIBTK’11 18. Ulusal Isı Bilimi ve Tekniği Kongresi, 07-10 Eylül 2011, ZONGULDAK. İlyas KARASU, M. Serdar GENÇ, Ünver KAYNAK, Hüseyin YAPICI, Yunuslama Hareketi Yapan NACA0012 Kanat Profili Etrafındaki Düşük Re Sayılı Akışın Sayısal Olarak İncelenmesi, III. Ulusal Havacılık ve Uzay Konferansı, UHUK 2010, Eskişehir, Türkiye, 16-18 Eylül 2010. M. Serdar GENÇ, Murat Gökçek “Kayseri-Pınarbaşı Rüzgar Enerjisi Potansiyeli ve Enerji Maliyeti” V. Yeni ve Yenilenebilir Enerji Kaynakları Sempozyumu, Kayseri, Türkiye, 16-17 Ekim 2009. M. Serdar GENÇ, Murat Gökçek “Estimation of Wind Energy Potential in Kayseri” 17. Ulusal Isı Bilimi ve Tekniği Kongresi, ULIBTK’09, Sivas, Türkiye, 24-27 Haziran 2009. M. Serdar GENÇ, Ünver Kaynak, Nafiz Kahraman, “Control of Flow Separation and Transition Point over an Aerofoil at Low Re Number using Suction”, 17. Ulusal Isı Bilimi ve Tekniği Kongresi, ULIBTK’09, Sivas, Türkiye, 24-27 Haziran 2009. Gülşah ÖZIŞIK, M. Serdar GENÇ, Hüseyin Yapıcı, “Hareketli Isı Kaynağına Maruz Kalan İçi Boş Bir Kürede Meydana Gelen Üniform Olmayan Sıcaklık ve Isıl Gerilme Dağılımları”, Ulusal Isı Bilimi ve Tekniği Kongresi, ULIBTK’09, Sivas, Türkiye, 24-27 Haziran 2009. M. Serdar GENÇ, Ünver KAYNAK, Gary D. Lock, Düşük Re Sayılı Akışda NACA2415 Kanat Profili Üzerindeki Ayrılma Kabarcığının Sayısal ve Deneysel İncelenmesi, XVI. Ulusal Mekanik Kongresi, UMK2009, 22-26 Haziran 2009, Kayseri. M. Serdar GENÇ, Ünver KAYNAK, Gary D. Lock, “Hücum Kenarı Slatlı Kanat Profili Etrafındaki Düşük Re Sayılı Geçiş Akışında Akım Ayrılmasının Kontrolü” II. Ulusal Havacılık ve Uzay Konferansı, UHUK 2008, İTÜ, İstanbul, Türkiye, 15-17 Ekim 2008. Gülşah ÖZIŞIK, M. Serdar GENÇ, Hüseyin Yapıcı, “Hareketli Isı Kaynağına Maruz Kalan Çeşitli Parçalarda Termal Gerilme Dağılımlarının İncelenmesi” II. Ulusal Havacılık ve Uzay Konferansı, UHUK 2008, İTÜ, İstanbul, Türkiye, 15-17 Ekim 2008. M. Serdar GENÇ, Ünver KAYNAK “Kanat Profili Etrafındaki Düşük Reynolds Sayılı Akım Kontrolü ve Türbülansa Geçiş Modellerinin Etkisi”, ANOVA Kullanıcılar Konferansı 2, Ankara, Türkiye, 7-9 Ekim 2008. M. Serdar GENÇ, G. Özışık, N.Kahraman, “Flaplı kanat profilinin aerodinamik performansı” 16. Ulusal Isı Bilimi ve Tekniği Kongresi, ULIBTK’07, Kayseri, Türkiye, 30 May-2 Haz.2007. G. Özışık, M. Serdar GENÇ, “Hareketli ısı kaynağına maruz kalan içi boş bir diskde sıcaklık ve termal gerilme dağılımları” 16. Ulusal Isı Bilimi ve Tekniği Kongresi, ULIBTK’07, Kayseri, Türkiye, 30 May-2 Haz.2007. G. Özışık, M. Serdar GENÇ, “Hareketli ısı kaynağı ile çevresel olarak ısıtılan dairesel bir borudaki geçici termal gerilme dağılımı” 16. Ulusal Isı Bilimi ve Tekniği Kongresi, ULIBTK’07, Kayseri, Türkiye, 30 May-2 Haz.2007. M. Serdar GENÇ, M. Kemal Apalak, Z. Gül Apalak, “Yapıştırıcı İle Birleştirilmiş Kompozit Tek Bindirme Bağlantısının Çekme Yükü Altında Deneysel Ve Teorik Olarak Hasar Davranışının Belirlenmesi”, I. Ulusal Havacılık ve Uzay Konferansı, UHUK 2006, ODTÜ, Ankara, Türkiye, 21-23 Eylül 2006. Ziya DOĞAN, M. Serdar GENÇ “Ses Altı Hızlarda Farklı Uçak Kanadı Profilleri Etrafında Akışın İncelenmesi”, I. Ulusal Havacılık ve Uzay Konferansı, UHUK 2006, ODTÜ, Ankara, Türkiye, 21-23 Eylül 2006. M. Serdar GENÇ, Nesrin Demir, Nafiz Kahraman, “Bir Metan-Hava Yakıcısında Dönmeli Akış Etkisininin Sayısal Analizi”, III. Ege Enerji Sempozyumu, Muğla, Türkiye, 24-26 Mayıs 2006. M. Serdar GENÇ, “Uçaklarda Buzlanma”, Kayseri VI. Havacılık Sempozyumu, HaSeM’06, Kayseri, Türkiye, 12-14 Mayıs 2006. Nafiz KAHRAMAN, Ziya DOĞAN ve M. Serdar GENÇ, “Gaz Türbinli Motorlarda Sıkıştırma Oranının Verime Etkisi”, Kayseri VI. Havacılık Sempozyumu, HaSeM’06, Kayseri, Türkiye, 12-14 Mayıs 2006. M. Serdar GENÇ, Z. Gül Apalak, M. Kemal Apalak, “Failure Analysis Of Adhesively Bonded CFRP Composite Single Lap Joints”, Kayseri VI. Havacılık Sempozyumu, HaSeM’06, Kayseri, Türkiye, 12-14 Mayıs 2006.